Just as a preface to my viewers, I had to take a few personal days to straighten out some affairs. I really appreciate your guys’ patience with me and I hope my writing pays the dividends on that! How do you put infinite causal loops and time travel physics onto The CW? Well you give it boyish good looks and put it in a tight leather suit. At least I think its leather. Anyways…It takes a lot of guts to tackle high end physics like these when you’re also dealing with more philosophical questions of destiny and fate. “The Flash” handles this in its latest offering- the cap to a wonderful two parter- by a little trick called “inattention blindness”. Remember that video where the kids are throwing a basketball around and you’re asked to count how many times they pass it, but 40% missed the fact that there was a gorilla that walked through? Same thing with this episode. Because we aren’t focusing on the physics, we accept them and, strangely enough, that makes them more palatable. 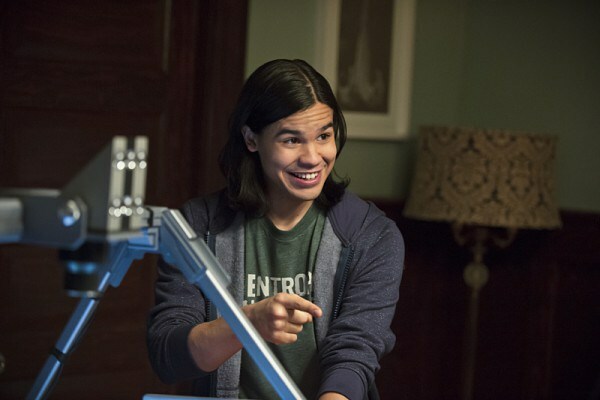 Of course is doesn’t help that good ole Cisco explains them with references to Terminator and Back to the Future. Cisco spends a surprising amount of time studying his pop culture. At the end of last week’s episode, we were treated to the nuclear fireball that was Firestorm trying to separate into its two constitute personalities- former S.T.A.R. labs scientist Ronnie Raymond and Professor Martin Stein. This episode picks up right where we left off, with the separation a success. Ronnie is reunited with Caitlin and Stein is reunited with his wife. But the effects of their coagulation are still evident- they can both feel when the other is in danger. And that danger comes from recurring baddie General Wade Eiling, who’s determined to learn the secrets of Firestorm to use in for his own nefarious purposes. 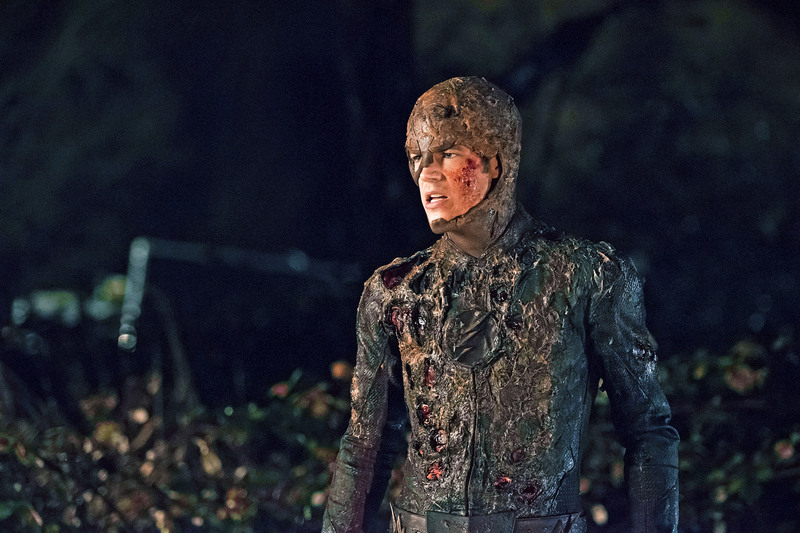 It’s a tough pill to swallow as Barry learns who was there the night his mother died. Meanwhile, Barry has learned that there were two speedsters in his house the night his mother died- and he was one of them. This is where the episode can get a bit heady, and lesser writers would try to spoon feed all of the heavy science to the viewers. However the focus here, thankfully, is on the human aspect of it and its eventual conclusion- as Barry says he is “destined to fail”. He was there the night his mother died. His mother still died. Ipso facto, Barry fails to save his mother, his father and himself. While it is heartbreaking, it begs the question of fate. 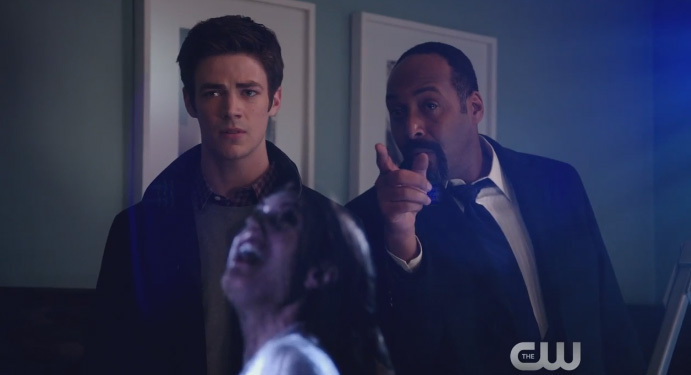 It goes like this: Barry saw his mother killed by a speedster; Barry’s father takes the blame and gets sent to prison; Because of this Barry becomes a forensic scientist to try and clear his father’s name; This places him in his forensics lab the night the particle accelerator goes boom, which makes him The Flash; As The Flash, he saves an awful lot of lives. It’s all very heady Meta physics, and to a geek and a nerd like me, it’s a brain-gasm of the highest order. But what shines in this episode are the personal stories. Throughout the season we have seen how Ronnie’s apparent death affected Caitlin. She has become cold and a bit distant. When she finally did give herself a crutch to lean on, she wound up drinking way too much. Now- he’s back. It’s every grieving persons dream come true…and its happens for her. A big reason this has such an impact with the viewer is thanks to Robbie Amell as Ronnie Raymond. In what is effectively his debut in the role, he gives the character a fun twist. I did sense a bit of the under-handed charisma that Robbie’s arrow shooting cousin is known for, which coupled with his intelligence make him absolute eye candy. Meanwhile, Victor Garber plays the thorny Doctor Stein with a jambalaya like mix of Doc Brown, The Doctor from Doctor Who and Obi-Wan Kenobi that is delectable on our collective palates. Unfortunately, Iris’ subplot is once again weak. It’s not for lack of effort on Candice Patton’s part, but just because the writers give her so little to work with. Especially now that she doesn’t have to worry about Barry pining after her, there is just no meat in her storyline. It’s so bad in fact that her co-worker has to provide the impetus for her to investigate her S.T.A.R. Lab friends some more. I get that she wants to be taken seriously as a reporter, but that implies reporting on things that are relevant to the world around you. And she has the best in of all- friends in S.T.A.R. labs, a picture of The Flash on her phone, and 3 friends working in prominent positions in the police. She needs to stop feeling so entitled and report on what the most interesting story is- The Flash! When all the ingredients are added together, this is one of the best offering from “The Flash” this season. It has all the emotional keynotes, hits on some very heady subjects in ways that are easily digestible and, most importantly, makes us shake our fist and wonder WHO THE HELL DOCTOR WELLS IS!